THE FIREWORKS ARE STAGED ON THE NORTH ATTLEBORO SOCCER FIELDS IN THE REAR OF THE HIGH SCHOOL. TO AVOID ANY INJURIES, THE Spring St & Stoddard Dr walking paths to the High School & Middle School propertIES are closed from Friday Morning until Saturday Night after fireworks show. 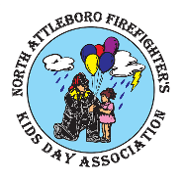 ADDITIONALLY, EVERY YEAR WE LOOK TO AREA RESIDENTS & LOYAL SUPPORTERS OF NORTH ATTLEBORO KID'S DAY, TO MAKE A DONATION OF ANY AMOUNT TO HELP SUPPORT OUR SPECTACULAR FIREWORKS DISPLAYS.